CO Senator Cory Gardner has taken $3.8 million from the NRA and reliably votes against measures to reduce gun violence in the U.S.
Another day, another gun massacre. Still Republican legislators don’t even lift a finger to address it. 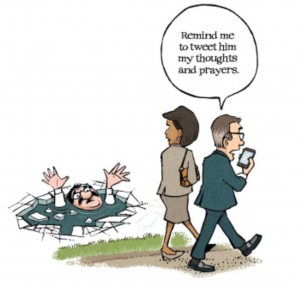 “Thoughts and prayers” is their only response, since it holds off action on the insane proliferation of guns in this country, and blocks discussion of what can be done about mass gun violence in the U.S. There is only one reason why gun massacres are now a common occurrence: America is awash in guns. It’s way too easy to get guns, even extremely dangerous ones, and it has been for far too long. People can legally amass entire arsenals. The colossal number of guns washing around in the U.S. compared to other countries makes it extremely easy for anyone with even the most petty grievance to use a gun to settle a perceived score by killing people en masse. And that’s exactly what is happening. Typically after a massacre like Las Vegas or Texas or Newtown, the first thing people worry about is what the shooter’s motive was. Why waste time doing that? By it’s definition a mass shooting is a senseless, pointless, mindless mass murder. It is MINDLESS terrorism done for the only purpose of making people suffer. A motive has no relevance any more when any American can get ahold of gun, or an entire arsenal of guns, and seek satisfaction against perceived injustices by shooting at peaceful people in gathered in movie theaters, grocery stores, concerts, nursing homes, schools, maternity ward, you name it. If it hasn’t been shot up yet, you can be assured it will be soon as long as we do nothing to stop it. 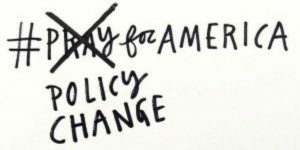 The only way to reduce now-almost daily gun massacres is to take drastic and immediate action to start reducing the number and availability of guns in society. Barring that, things will only get worse until we live in a dystopic society in which we all constantly live in fear for our lives. Most Americans support gun control measures, but Congress has long stood in the way. Democrats have worked for decades to pass measures to wind down the easy availability of guns. They’ve called for universal background checks, closing the gun show loophole, banning high-capacity magazines, silencers and the sale of assault weapons. Some Democrats even sacrificed their elected positions to assure action was taken towards reducing gun massacres. Meanwhile, most Republicans are in the pocket of the National Rifle Association and block progress against gun proliferation at every turn. The Republican majority in Congress even blocked the Centers for Disease Control (CDC) from researching firearm injuries and deaths in 1996, even though it’s a clear public health hazard. Republicans’ refusal to address the out-of-control gun massacre problem in the U.S. is barbaric, inhumane, and contrary to the human instinct of problem-solving. It’s counterintuitive, counterproductive and tells constituents “We just don’t give a sh*t about you.” Nothing is more of a slap to American citizens than for these elected officials to simply say “thoughts and prayers” and then walk away from their responsibility to protect the populace from a known and worsening problem. It’s sick. The blood of all gun massacres is on the hands of Republicans as long as they continue to stay quiet, do nothing, obstruct proposals to address the problem, and forsake the safety of American people. There are plenty of ways to address gun violence legislatively. For one thing, start by reining in the Second Amendment. There is a strong justification to put similar limits on the Second Amendment to address what is now a public safety emergency. It is Congress’ duty to enact laws to prevent the “substantive evil” of gun massacres in the U.S. Tightly regulate ammunition. Bullets are not protected under the second amendment, so government can regulate them immediately, and should. The internet helps make it possible to spot mass purchases of ammunition. Keep a national database of gun owners, gun purchases and purchases of ammunition. Track every person who is found to be amassing an arsenal. Check to see if they have a domestic violence or assault conviction, because that drastically increases their chance of engaging in a gun massacre. Limit people to owning two guns max from here on out. Require every gun owner to report to how many guns they own, the types and serial numbers to law enforcement. Make the registered owner of a gun legally responsible for the injuries and deaths traceable to that gun, unless it has been reported stolen. Prohibit gun shows entirely. They make illicit purchase of guns far too easy. Immediately block the retail sale of AR-15s and other types of assault rifles and all automatic weapons. Make guns as hard to get as abortions. Require specific architectural designs for gun stores to increase security and prevent thefts, specify the amount and type of security they require (and security should be extensive), require retain gun stores to have high-definition cameras and specify the number of cameras required per the number of square feet of store size. Prohibit the sale of guns in any retail establishment that also sells diapers. Require extensive psychological training for gun store sales staff to help them assess purchasers’ mental state. Require all purchasers of guns to submit an original, signed note from their doctor saying they are of sound body and mind to responsibly own a gun. 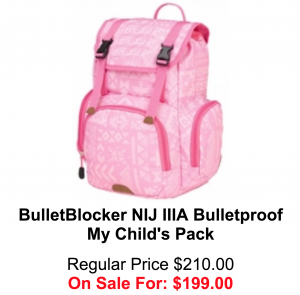 Make all gun purchasers watch graphic videos of what a bullet does to a body, including photos of gun wounds, new and healed, prior to purchase. What can be done if Republicans continue to block gun control measures? 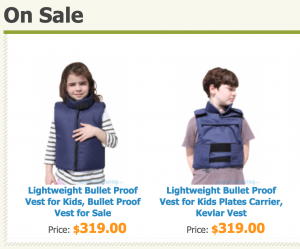 Buy bullet-proof clothing for yourself and your kids. Things will only get a lot worse if Republicans remain in elected office. If Republicans insist on doing absolutely nothing, then the government needs subsidize at the rate of 100% the purchase of bullet-proof clothing and accessories for every American. It’s only fair. A country that makes guns freely available to every citizen and fails to take responsibility for the resulting calamity needs to provide some means for those who stand to get caught in gunfire to protect themselves. Anyone who attends a school, goes to a movie, shops in a mall or grocery store, goes to church, attends a concert or participates in an activity where they can be shot deserves protection, and since the government created the problem, it must provide protection from the problem until the problem can be solved. Vote for Democrats. It’s the only way out of the mess Republicans have created in this country by prioritizing the wants of the National Rifle Association (NRA) over the lives of innocent people. Sorry there Shameless. I didn’t mean to cut you off short, but you caught me in the middle of a phone call. I’m kind of busy right now. We have dead to lay to rest. And we’re trying to make the necessary notifications. But clearly, you’re not a deliberate man. I think your problem is comprehension. But no worries, it will come to ya. Would you like to go for Double Jeopardy, where you can lose even harder? It’s really none of my business Seamless, but you might want to cut back on the “Yayo” use a bit. Your tweets are becoming a bit discombobulated. Nobody needs drugs to see through your “secret” identity, Tim. You leave a trail of bloated, self-important rambling like a slug trails slime. I don’t think you can help yourself. Why don’t you try a little salt on your demon slugs? Works pretty good with you banana slugs. Or so my children tell me. Geez, Tim…you’re coming apart faster than GJResult. South Korean English radio reporting “Needtoimpeach.org” commercial playing with subtitles on North Korean government TV channel. It would appear that there is a cause in common, and some treason may occur. If you think there’s treason afoot, Tim…I invite you to take any action you deem appropriate. Go skulk around Main Street Bagels again. maybe. Thanks for the invitation, Shameless. But actually, you’ve already given me the answer I was looking for…..and in only twenty three hours and eleven minutes. Thank You. That’s the great thing about you, Tim…no matter the answer, you always say, “That’s the one I wanted”. Okay, Shameless. You caught a break. I have some time for you now, after I was so rudely interrupted. Do you have something on your mind? I mean, besides your usual drivel. And thank you for asking. His name was Mike Harlow. Perhaps you knew him? Are you really using a friend’s death as a jumping point to try and engage with me? What the hell is wrong with you? Go take care of those arrangements, if you can fit it in. You just made a mistake. I have no desire whatsoever to engage in dialog with you. I was just trying to get it out of the way. You’re a vindictive little man, without honor. I pity you. It is well for you that you do not believe in an Almighty God, a merciful God. And in your day of reckoning, which must come to every man, I am confident that yours shall be a self-fulfilling prophecy. Amen. I’m not the one using a dead “friend” as a prop, Tim. That’s kind of your thing, isn’t it? Sucking off of other people’s experiences and using them for your own purposes with half-truths and innuendo, never once bothering to just tell the truth? Call yourself a Patriot. Call yourself whatever you like. As for honor, I think I’m okay being on the other side of what *you* think it is. Your concept of honor is far too subjective and self- serving for me to stand. To ask the American people to voluntarily disarm in the face of terrorism and mass murder is insane. That’s an apple. And to try to disarm them involuntarily would amount to assisted suicide. And that’s an apple. And anybody who thinks they’re going to accomplish either is a banana. Relax, Tim. No one is going to take your guns. If dead children didn’t make people care, nothing will.